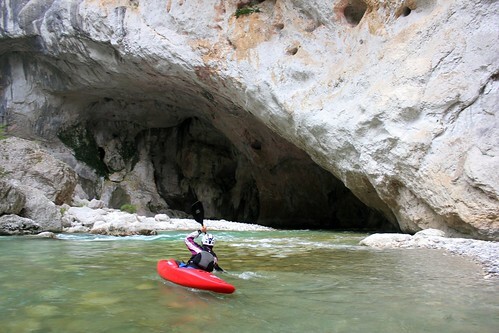 Words cannot do this place justice, but it’s suffice to say the Verdon Canyon should be on every kayaker’s bucket list! Paddle through caves and even ‘underground’ on the beautiful turquoise waters of one of the world’s most spectacular rivers set in a deep, committing limestone canyon. The Verdon is not for the faint hearted. Although the rapids are not technically difficult, it is a very long day on the river (around 7-8 hours) and the consequences of going wrong could be, in some places, pretty catastrophic. 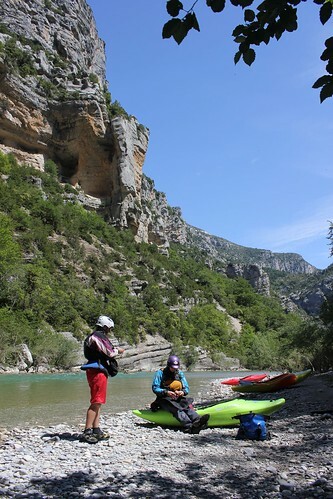 This is where good local knowledge is essential and on this trip you couldn’t be better looked after: as well as the expertise and professionalism you’d expect from our regular coaches we’ll have the expert local guidance of the most experienced Verdon Canyon guide available. Every season and every water level brings changes to the canyon, so his up-to-date knowledge of the river is invaluable. He’ll also ensure we don’t miss any of the highlights, showing us the best lunch spots and even checking out a hidden waterfall ‘inside’ the canyon walls! Words struggle to describe this magical place… but maybe video can. 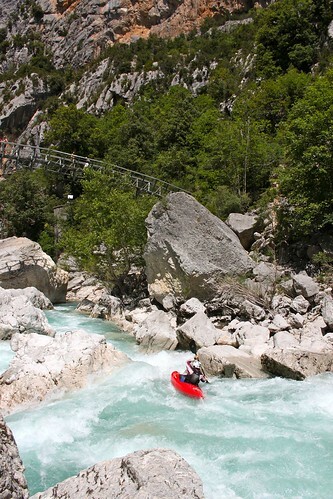 This is from our 2013 Verdon Canyon trip (with thanks to Root Down for the edit). Video not enough? Take a look at this photo album on Flickr. The river starts off pretty gently, giving you plenty of opportunity to soak in the view and appreciate the sheer magnitude of the limestone cliffs. As the river picks up pace, we become increasingly committed. 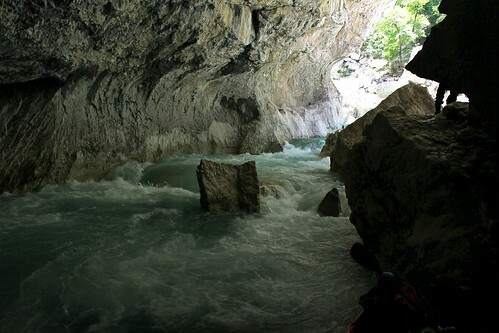 You’ll weave around rocks, slide down shoots and squeeze though gaps so small that a kayak barely fits through. Knowing where to go is essential. Most of the river would be classed as grade 2-3 if it wasn’t so remote, and there weren’t siphons to avoid. This river is less about the white water and more about the amazing all round experience, however there are still a few rapids to keep you on your toes, which at most flows are grade 3+ to 4. We can’t think of another river that compares, despite all of our travels! 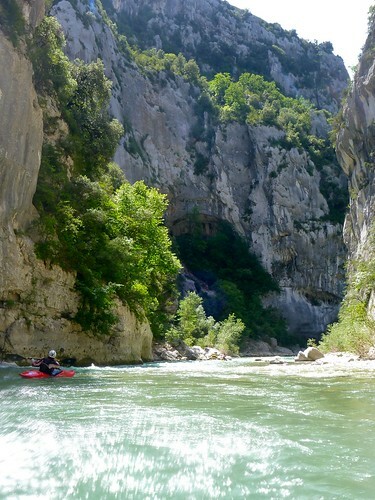 Throughout July, the Verdon has scheduled dam releases so we know what river level to expect. The full canyon trip is very long day on the river and as such we will want to get everyone on location the day before in order to ensure we are all prepared. We will set up a shuttle the day before or arrange a shuttle driver to collect us, as the shuttle itself can take a couple of hours at each end. We’ll have beers / champagne waiting for us at the take out then we’ll head to a local restaurant to eat, drink and be merry to celebrate what is always a fantastic day in the canyon. Our base will be in Castellane. This is an absolutely stunning region which everyone can enjoy. Your non-paddling friends and family are welcome to join us for all but the paddling if they so wish; there are some fantastic hikes, bike routes and world-class climbing in the vicinity. There’s also a pleasant section above the Canyon that weaker paddlers, or those who aren’t keen on the idea of the long, committed day on the water may prefer. Contact us to make arrangements for any of these options. 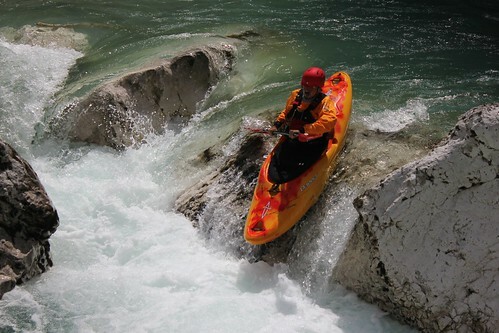 You’ll want to be relatively fit, confident on grade 3+ and have a solid white water roll. We will only take paddlers into the canyon that we are confident have sufficient skills and fitness to remain safe all day. 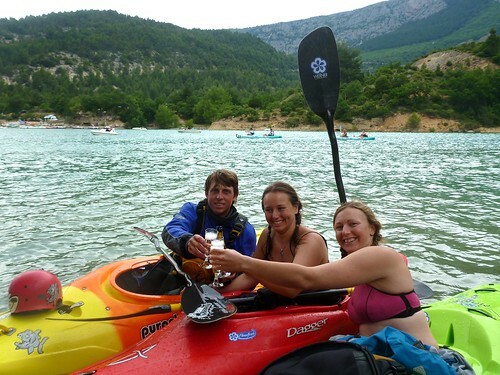 Therefore, if we haven’t paddled with you before, we may require you to book a minimum of a half day session with one of our coaches so that we can ensure you’re up to it. We have a French Alps trip in the week preceding, which would give an excellent opportunity to sharpen your skills and get to know our coaches before heading into the canyon. Please get in touch if you need any help or guidance. This price includes guiding from both a top local guide & a highly qualified FlowFree coach, accommodation for the night before and the night of the descent, shuttle service and celebratory take out drinks. It does not include any other food & drinks, personal travel insurance or travel to & from the area. Please contact us by email or phone to confirm there are places still available on this trip and / or to speak to us about any queries you have. A £100 non-returnable deposit is required on booking with the remaining money to be paid no later than 30 days prior to the start of the trip. Payment can be made via cheque, BACS or PayPal – full details can be found under the ‘info’ section of the website. To pay the £100 deposit via PayPal or credit card, you can use the button below.